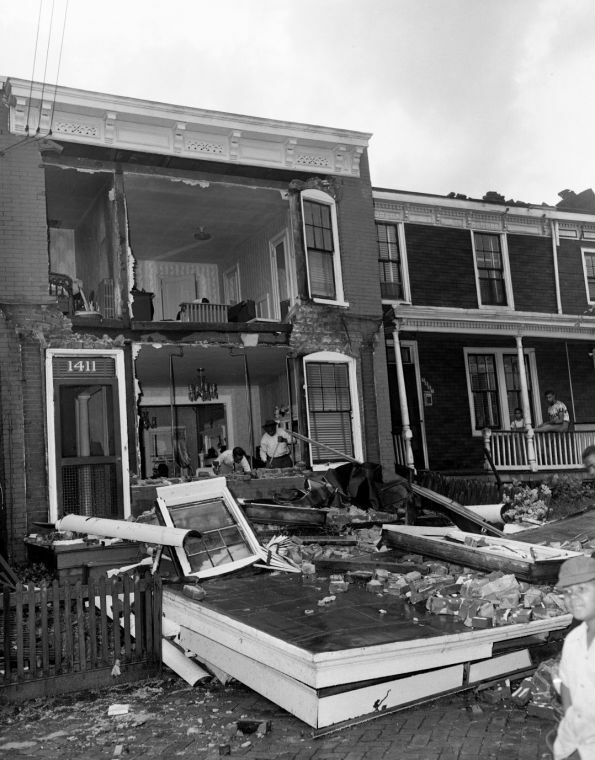 Richmond history and weather are two items up there on my list of very favorite things, so it should come as no surprise that a blurb in the Richmond Times-Dispatch with a picture of damage from an F3 tornado that ripped through Downtown Richmond on June 13, 1951 piqued my interest. I remember my late grandma telling me a story once of a terrible windstorm or tornado coming through Byrd Park where she lived a long, long time ago, and I figured out this must have been it based on the map of the twister (below) that had it crossing the James River just south of Byrd Park, and then ripping into The Fan and going straight down Cary Street between Meadow Street and turning towards Monroe Park near the VCU campus. 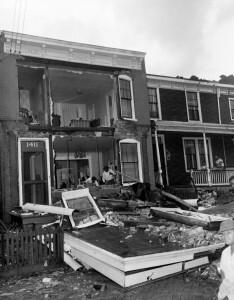 This was an F3 tornado, which by definition packs winds between 158 and 206 miles per hour. In its wake, the tornado injured dozens of people, destroyed 100 homes, and damaged more than 1,000 houses and buildings in Richmond, including ripping the bell tower off Grace & Holy Trinity Episcopal Church (seen below), the top of which was never rebuilt. 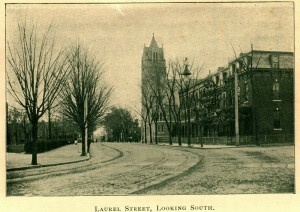 I don’t know for sure, but there’s a large swath of largely later 20th century construction and empty lots along Cary Street between Meadow and Randolph Streets to this day, while the rest of The Fan and Midtown remains intact. 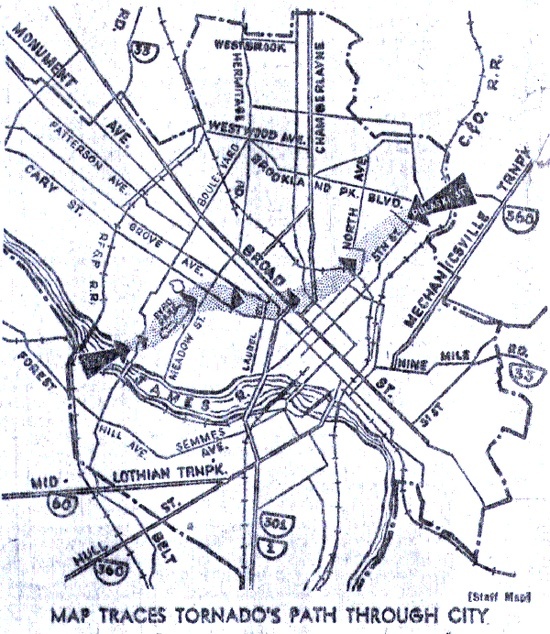 Some areas (especially south of 195) were demolished for the construction of the Downtown Expressway, but it makes me wonder if a lot of the destroyed or heavily damaged homes were just never rebuilt. 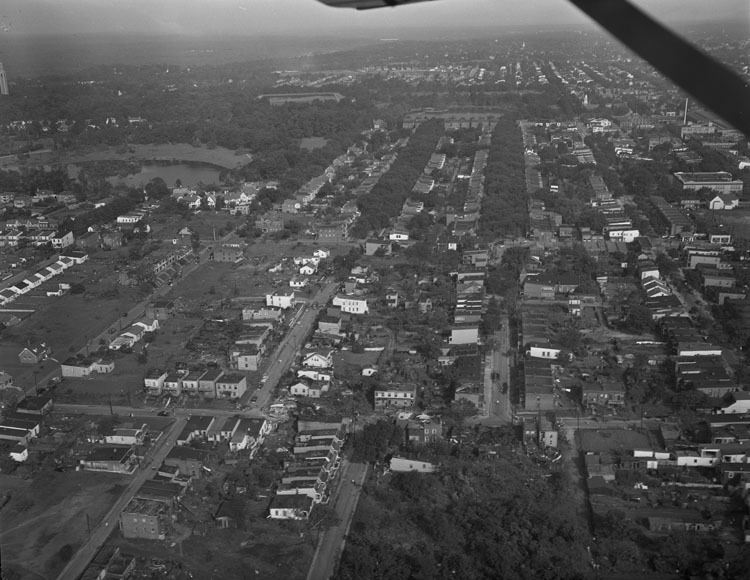 Below is an aerial view of the tornado’s destruction, taken facing west, over the Randolph neighborhood. To the upper left, you’ll notice Byrd Park’s Swan and Shields Lakes.